In the beautiful Barlow home, built in 1909, Guild House serves lunches Monday through Friday from 11:30am through 1:30pm. Impress your clients and friends with excellent meals prepared by some of Bakersfield's finest cooks. All meals are prepared on-site daily and include soup, entree, rolls, dessert and beverage for just $15.95. Reserve a private room for board or staff meetings and lunch will be served efficiently and unobtrusively as you conduct your business. Volunteerism is often critical to the success of nonprofit organizations. The Child Guidance Clinic is no exception. It depends on the work of the Bakersfield Child Guidance Guild consisting entirely of volunteers. Many of Bakersfield's residents are familiar with the gourmet quality lunches served at Guild House but may not be aware of the magnitude of the work performed by the members of the Child Guidance Guild or those who benefit from their efforts. Founded in September 1958, the Guild's main objective is to organize volunteers to conduct fundraising activities to assist and support the Henrietta Weill Memorial Child Guidance Clinic. Various fundraising events have been conducted by Guild volunteers, including theater parties, fashion shows, luncheons as well as a door-to-door campaign, known as "Operation Doorstep." In March 1963, thanks to the efforts of Charlotte Ramirez and her committee, a tea room, known as "Guild House," was opened at 829 Chester Avenue. By 1966, Guild House was in desperate need of larger quarters. Guild member, Millie Sudarsky and her husband, Jerry, purchased the Barlow House at 1905 18th Street with the understanding that the Guild would lease the house for their tea room and pay for upkeep and maintenance. The house was built in 1908 and occupied by Charles Barlow, a prominent geologist, and his family. The two-story home still has the original woodwork and mahogany mantelpiece as well as the beveled windows and glass made especially for the house by Gumps of San Francisco. The dining room has a signed Tiffany "Carnival glass" chandelier and wall sconces. The large basement serves as the Guild's office as well as storage space. The extensive use of hardwood throughout the upper and lower levels gives the interior of the home the warmth and character so often found in the stately homes of that time. In 1975, Jerry and Millie Sudarsky sold the Barlow House to the Guild for the exact price they paid for it nine years earlier ($35,000). From September through June, Guild volunteers serve lunches Monday through Friday from 11:30 a.m. to 1:30 p.m. The three-course lunches include fresh-baked rolls or muffins, specialty soup, a delicious entrée and a marvelous dessert. 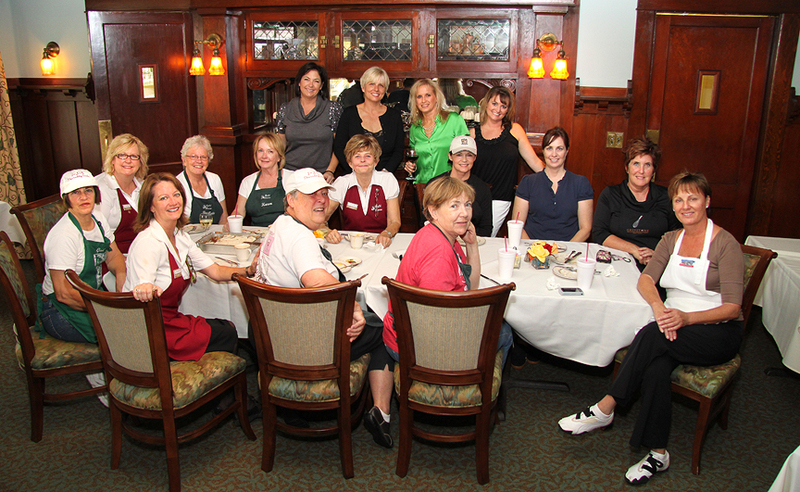 The waitresses proudly inform the patrons that "all food prepared for a good cause contains no calories!" The head cook starts the day at Guild House by arriving at 7:00 a.m. to check the day's menu. The other cooks arrive by 7:30 a.m. to assist with the cooking. The hostess arrives around 8:30 to review the reservation book, respond to phone messages, and to confer with the head cook regarding the number of lunches to be prepared and to decide if they can accommodate walk-in business that day. The waitresses arrive at 9:00 a.m. to set the tables, cut lemons, make coffee and tea and perform the daily upkeep. Following lunch, the waitresses clean the tables, lay out fresh linens, fill the salt and pepper containers, restock the refrigerator and clean the serving areas so that the house will be ready for the next day. The waitresses, dishwashers and cooks alternate the days they work. An average day has at least 4 to 6 waitresses serving between 45 to 90 people. Guild House also has an evening/weekend crew for special events such as teas, dinners, weddings, rehearsal dinners, anniversary parties, showers, etc. To ensure a unique experience for these occasions, the Guild has created a special events menu. Currently, the Guild has 165 active members who volunteer their time to cook, serve customers or wash dishes. Guild members also do all the decorating, manage the books, prepare the menus, research recipes and recruit new members. On Thursdays, Guild House presents fashion shows in which volunteers model clothing provided by local boutiques. Committed to raising at least $40,000.00 a year for the Clinic, the Guild often exceeds this amount. To date, the Guild has raised more than $2 million dollars for the Clinic. This achievement demonstrates what caring people in a community can do.